1. I have a little Ca Fe Su Da problem. 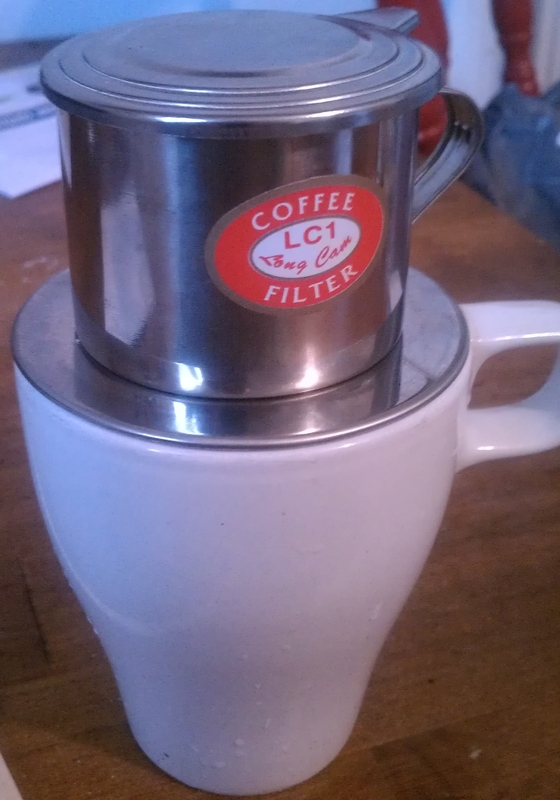 It wasn’t so bad when I would add random quantities of regular coffee to my phin thing, but once I got a hold of Pho Lang Tang’s coffee, which includes a portion suggestion, I’ve been hooked. The coffee is complex: grassy and smokey and sweet, but it still stands up to the typical Jeff treatment of ice cubes, sweetened condensed milk and (candidly) dirty mugs. One side-note from my favoritest of favorite cookbooks - makes sure the SCM is at room temperature. dried thyme get what they deserve. Stalkers may take note: Clifton and Ludlow all the way down to the Parkway and then MLK, up behind Good Sam, down Dixmyth back to Clifton. If I can make it up the slight incline by the hospital, I can nail it. My attention starts to fade away at 4PM or so (as if it’s ever that great anyway), but how I feel through the morning is worth it, not to mention that I am starting to vaguely resemble a human being. 4. This is the big one: Car. I have a nearly infinite capacity to swim against the tide, but the reality is that I lose about two hours a day. I’ve been riding the bus for three years now, and I’ve grown weary. The calculus becomes more agonizing when I cosnider how many things I need to work on – I need more time to write, to jog, to sleep, to keep the pile of dirty dishes manageable. I don’t technically own it and the poor thing could die at any time, but it can take me from home to work, with a grocery store happily in between. And it’s ostensibly a convertible. 5. 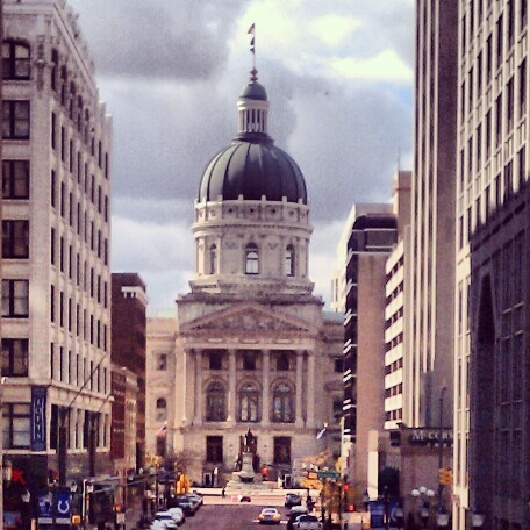 Day trip to Indianapolis last Saturday included a swanky dinner. I’m still thinking about the cocktail sauce – this brilliant supernova of horseradish that fades instantly into the sweetness of the tomato And, obviously, one of the two or three best best steaks I ever ate. Waiter slipped into a moment of candor and told me that navy bean soup had a tomato base, (thus rendering the million online approximations of the recipe completely wrong) but otherwise similar to mine. Consider going if you’ll be in town. Shapiro’s and an afternoon gelato from Goose the Market. And maybe a margarita if you’re feeling sassy. 6. Saying Guanciale (gwan CHA-Lay, according to Mr. Biaggio) is almost as fun as cooking it. It’s typically derived from jowl rather than belly, so it has a different mouthfeel – but a much stronger flavor only amplified by the peppery seasoning. I think it’s my new favorite thing. 7. I want to make this. 8. Latest pizza crust experiment was stunning. Used “00″ flour, a two day ferment – skillet, then broiler. Method differs slightly from the SE recipe, but SUCH a good char. Post next week. Saturday will be carbmageddeon, with friends joining me with toppings for the offical consumation of my official pizza recipe. 9. I have just agreed to a meal in which… well… let’s just say the food chain will be dramatically shorter. More on this as it develops. I’ll spare you the elaborate rationalization as to why pickled vegetables are crucial to my lifestyle. Boils down to this: fruit snack in the morning, savory snack in the afternoon. Said savory snack should ideally be a vegetable, but seldom are days I’m optimistic enough to assume that I’ll actually EAT those raw carrots I hastily stuff into my manbag. So pickles. These represent some sort of evolutionary missing-link between a raw cucumber and a overly acidic refrigerator pickle. I LIKE that you still have hints of floral “cucumberousness” when you bite in. Obvious epidemeological warning: these pickles are perishable A week, at most. 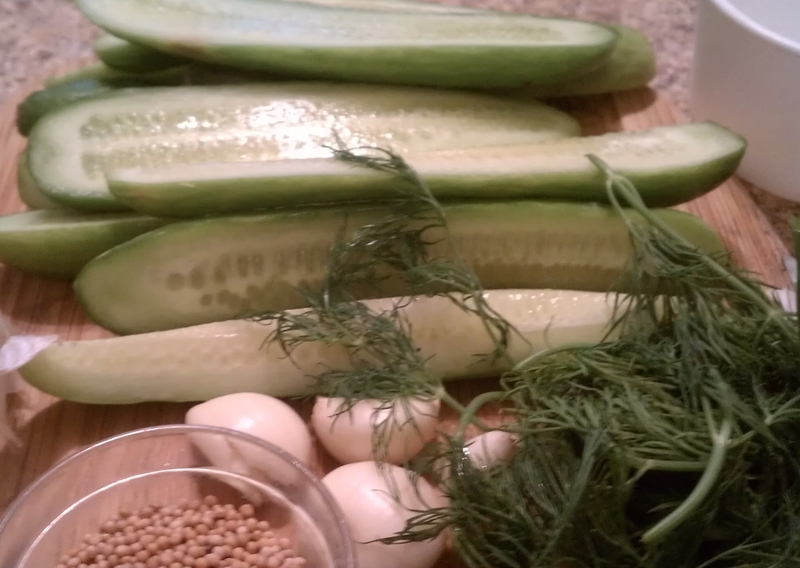 Add the cucumbers and the herbs, cook for a moment. in the warmish water. 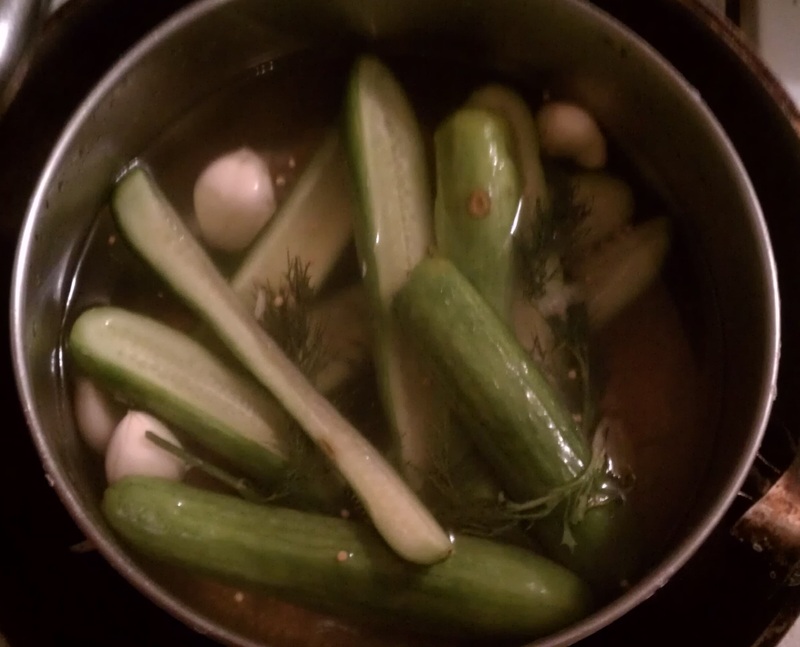 Add cold water until the pickles are covered. Let sit, covered, at room temperature for a few hours. Taste for crispness and flavor. Jar up. Refrigerate. Devour within a week. That was a fun day. Meant a lot to share it with you. That list is an awesome list. Soba. Yum. I’m so happy you are blogging again. I’d missed you. We are lucky to have, in Cincinnati, an importer of Vietnamese Coffee, and over the last month or two, I’ve really taken a like to it. I’m still never sure how tightly to twist the phin, but when I get lucky, the results are wonderful. I don’t think I’m quite in “race shape” yet, but I’ll keep trying. Maybe a 5k in 2013. Let me know if you are ever in Louisville again.